Where does google store all the mails and stuffs?? Well, it does store all of em.. umm. check this pic below?? We all know, google is the pioneer in giving us free 1 GB space when MSN hotmail was charging us $19 per year for 250 MB. Following the google's trend, others followed the same. Now, it's so shameful to provide anything less than 2 GB for free. GOOGLE TEAM, thank you guys, you revolutionized the way we used emails. Coming to the point, so far we believed that google's gmail with 2 GB would be much more to fill it up with mails. Someone even calculated how much time would be needed to fill all those gmail space. It was like 10-15 years. geez :) Now, that's become white lie. 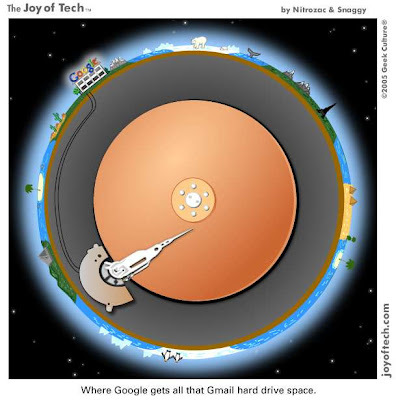 GMAIL users are short of space. WHAACK.. they filled their space?? that's true.. i don't know how but they did. I call em extreme living beings. Who lives always to the extreme limit. It's a big challenge to GMAIL as they initiated their project few years ago with name like 'INFINITY PLUS' or something like that. Out of topic,small gossip on 'INFINITY PLUS', aa. she asks " how much do you love me', he says, " love you infinity and you? " and she replies "infinity plus" and so. I just read a post by Rob Siemborski, Gmail Engineer. According to him, Google is planning to increase the limit of GMAIL from 2 GB to ......(fill in the blanks). It's not a blank cheque though. eyaaaand(american really stress that much for saying AND, i learnt that here), for paid users, gmail has big 25 GB at their service. I bow down to such service with my both hands up and in prostrating stance. I've used about 12% of my gmail space. Ashish, great!! i'm sure that's not just plain text emails right?? yah they are not just text mails. text mails matri ho bhanay ta sakdaina. pics haru cha. pics send garda kheri sent folder ma sab save huni raicha. yeap bro, Google is great. It is very very very userfriendly. It takes care of what we do online using their service. I'm very much fond of google.